A dedicated image capture and analysis system based on Windows® Embedded to provide standalone x-ray imaging (threat detection / package screening) for mailroom inspection machines. Most postal X-Ray machines comprise an industrial video camera pointed at a scintillating screen within the X-ray enclosure. X-ray images of the samples being screened are presented to the operator for further image processing and inspection, enabling post, bags, cases and other items to be screened for malicious, threat and contraband items. The initial project brief was to provide a software-based image capture and analysis system to replace an out-dated hardware-based video store. WyeTec designed and produced a solution that far exceeded the performance of the legacy system, at a third of the works cost. The system has subsequently undergone various updates, and has proved to be a highly successful, reliable and long-lasting product for the host company. Previous experience within the X-ray and non-destructive-test sectors enabled us to specify components that would provide the manufacturer with the best possible combination of cost-effectiveness, image quality and a feature-rich product – with the selection of a Matrox Frame Grabber and the associated imaging library being a key decision. Image processing techniques more commonly associated with high-end non-destructive-test (NDT) oriented X-ray equipment were applied to this new application, providing a user experience and image quality that was a significant step ahead of competitors’ products. Screenshot (above) of mailroom X-ray inspection system on Windows® Embedded operating system. 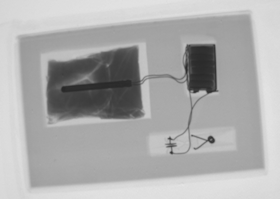 X-ray image shows a parcel containing a suspect device. The components are highlighted using image processing techniques more commonly associated with non-destructive test (NDT) applications. The operators of the new X-ray imaging system would not necessarily be computer literate, and it was important that the finished product presented itself to the end user as a dedicated unit, rather than as a PC running an imaging system. By licensing Windows® Embedded, a custom version of the Windows operating system could be constructed, with functionality restricted to the main X-ray imaging application. This was coupled with careful attention to the application's look and feel to create a dedicated image capture and analysis system that was simple and intuitive to use, robust, and that strengthened the manufacturer's branding and image. As an additional benefit, the use of Windows Embedded also reduced the works cost of these units, as both the licensing and hardware costs were lessened. Contact WyeTec today to discuss using XP Embedded to design and engineer dedicated x-ray imaging systems.